Russian President Vladimir Putin has called the breakup of the Soviet Union “the greatest geopolitical catastrophe” of the 20th century. “Tens of millions of our fellow citizens and countrymen found themselves beyond the fringes of Russian territory,” Putin said in a 2005 speech. While not all Russians necessarily agree with Putin’s characterization, most do view the breakup of the Soviet Union in 1991 as “a bad thing,” according to a Pew Research Center survey of Russia and 17 other countries in Central and Eastern Europe conducted between 2015 and 2016. And this view is not limited to Russia. For example, in Russia, as well as in the former Soviet republics of Armenia and Moldova, roughly seven-in-ten or more view the Soviet collapse as “a bad thing,” and, in Belarus, 54% see it in a negative light. Of the five other former Soviet states surveyed, adults in the three Baltic republics of Estonia, Latvia and Lithuania — which were forcibly incorporated into the USSR — are among least likely to view the Soviet breakup as a bad thing, with three-in-ten or fewer in each country holding this view. A more recent 2017 Pew Research Center poll in Russia shows a 10-percentage-point drop in the share of Russians who say the collapse of the Soviet Union has been a bad thing for their country (59% in 2017, compared with 69% in 2015). This change goes hand in hand with an improved overall economic outlook among Russians. Still, a majority of Russians continue to say the collapse of the Soviet Union has been a bad thing for their country. Positive feelings for the USSR generally are greater among older people in Russia and the other former Soviet republics surveyed. For example, while 78% of Russian adults ages 35 and older in the 2015 survey see the breakup as a bad thing, half of Russians under 35 feel this way. Age gaps of this nature exist in all of the former Soviet republics surveyed except Estonia, including in countries where those who have nostalgic views of the USSR are in the minority. For instance, in Ukraine, just 20% of adults under 35 see the Soviet collapse as a bad thing, while 40% of those ages 35 and over do. 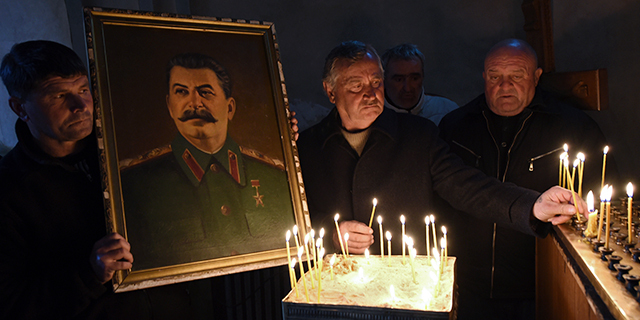 Nostalgia for the Soviet past also extends to views of its longest-serving leader, Josef Stalin, with adults in Russia and some other nearby countries expressing more positive views of Stalin than of Mikhail Gorbachev, who presided over the USSR’s final years. In Russia, 58% of adults see Stalin’s historical role in either a “very” or “mostly” positive light, compared with just 22% who feel the same way about Gorbachev. People in three other former Soviet republics – Georgia (where Stalin was born), Armenia and Moldova – also view Stalin significantly more positively than they view Gorbachev. Meanwhile, Gorbachev receives a higher rating than Stalin in the Baltic countries, as well in the Central European countries of Poland, Hungary, Croatia and Czech Republic.